Time To Let The Kids Play? As of writing this article, the Angels currently sit six games out of a second wild card spot (entirely too early for such talk), and 10 games out of first place in the AL West (this is a pretty good time to bring that up). There continues to be no timetable for Richards, Heaney, Skaggs or Wilson’s return, the Angels still haven’t gotten much from the LF spot of their lineup, and are still rolling out Weaver, Santiago and potentially David Huff again. We at MWAH certainly aren’t saying that it’s time for the Angels to give up, but if the Angels continue to play as poorly as they have and don’t receive any signs of pulling out of this nosedive soon, it may be time to consider letting the younger players in the organization have a go at it. The Angels currently have a wealth of players that are doing well or have done well at the AAA level but haven’t received a full look in the major leagues for various reasons. But at some point, it’s time to see what you have, right? Here are a list of players the Angels should strongly consider giving an extended look at later in the season. Could Jefry Marte become a more permanent fixture in the Angels lineup? 1B/3B Jefry Marte – Marte has done nothing but crush the ball since being promoted, and just looking at his physical skill set, this guy could turn into a fairly solid corner infielder. He’s a natural at third base, covering impressive ground for such a big, strong kid and making strong, accurate throws. He’s passable at first base, but barely. Offensive, he has excellent power, is a smart base runner and can work a count in his favor. Though his AAA numbers don’t jump off the page (.265/.354 12 DB 3 HR) those are pretty solid considering the miserable month of April Marte had. Possible Upside: An everyday starting 3B capable of hitting .270 with 20+ HR’s. 2. 1B/LF Ji-Man Choi – Choi’s first exposure to major league pitching didn’t go too well, though one could argue that an AB here and there every week or so isn’t conducive toward any sort of momentum. Since accepting his assignment to AAA, Choi has been on a tear, easily pacing the Salt Lake bees in doubles, homers, batting average and OBP since his arrival. It isn’t as if the Angels are receiving excessive production from their current LF options. Possible Upside: An offensive minded LF option capable of hitting .280 with 15+ HR’s. 3. 3B Kaleb Cowart – By now, Cowart has proven that his eye-popping numbers in AAA last season weren’t an inflated fluke. This kid really can hit AAA pitching. But the one way Cowart can make any adjustments to major league pitching is if he gets the opportunity to face major league pitchers. Possible Upside: A gold glove caliber third baseman, that can hit .270 with 15+ HR’s. 4. 3B/LF Kyle Kubitza – Kubitza’s defense has improved in AAA, and has been able to give the Bees a solid performance at both quarter infield positions as well as LF and second base. But after pacing all of AAA in doubles last year, Kubitza’s been less of an offensive force this year. Still showing an ability to reach base, run and hit, Kyle just hasn’t done enough of it to garner a promotion. Possible Upside: A starting LF/3B and leadoff or #2 hitter. 5. 1B C.J. 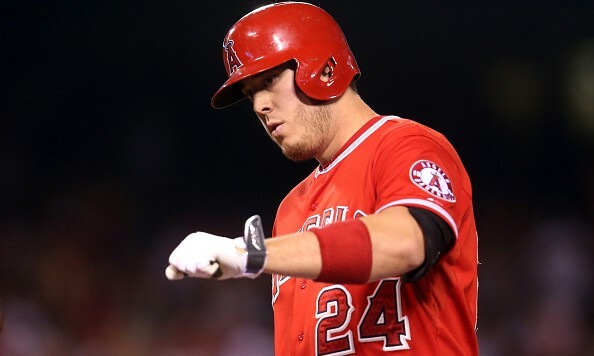 Cron – Cron appears to already be getting his shot with he Angels, but it’s safe to say that if he doesn’t produce to the level he’s capable of this year, it may be in the angels best interest to move on. While Cron has proven capable of making contact and driving the ball with power, he still isn’t mashing for power the way he’s capable of or expected to. Not to mention his batting average and OBP still aren’t helping the Angels out. Cron’s proven that he isn’t a bad hitter, but in his third season with the Angels, it’s time to prove that he’s a good enough hitter to stay in the major leagues. The Angels should continue to give C.J. a look through the end of the season. Possible Upside: A starting 1B capable of hitting .270 25+ HR’s. 6. LHP Nate Smith – Smith’s numbers are actually pretty solid in AAA when you consider the environment he is being forced to pitch in. His fastball has hovered around 90 and his change up and curve have both been effective out pitches for him. While the Angels may have a glut of pitching later in the year once Lincecum, Skaggs and Wilson arrive, it may be a good idea to let Nate Smith enjoy the more friendly confines of the Big A. Possible Upside: A backend lefty starter capable of eating upwards of 200 innings at a ~4.00 ERA. 7. RHP Jhoulys Chacin – The Angels may have brought in Chacin as an emergency measure, but upon further investigation it appears he was more of a buy low candidate. A former Rockies prospect, Chacin managed to post an ERA 3.62 or lower in three operate seasons playing for the Rockies. You’ll have a hard time finding many pitchers who have done that in their career. So far with the Angels, Chacin has worked his way to a 3.73 ERA with a solid 1.14 WHIP. Though there should be other options available, if Chacin pitches particularly well for the Angels, they should have the opportunity to ink him to an extension before he hits free agency this winter. While a rotation with Richards, Heaney, Skaggs, Tropeano and Shoemaker/Santiago/Smith leaves little room for Chacin, we should consider that Richards, Heaney and Skaggs are no guarantee to be healthy, Santiago currently looks best suited for the pen and Smith hasn’t been given the chance to prove himself. Possible Upside: A mid to back end starter capable of going 180+ innings with an ERA around 3.50.